My first day back at work after maternity leave was emotional one to be sure. But it also had its moments of wonderfully delicious randomness and absurdity -- you know, the things that make blog fodder. The most prominent of these moments arrived at about 9am. On my way back to my office from a meeting, I ran into our receptionist, who gleefully exclaimed that she's just dropped off something fun for me on my desk (did that read creepy? I think it read a little creepy. I didn't sound that way when she said it). Clearly excited to see my reaction, she trails me back into my office, actually clasping her hands in the way that bubbly people do as my eyes alight on the plate of homemade brownies that some loving soul had hand delivered for me that morning. 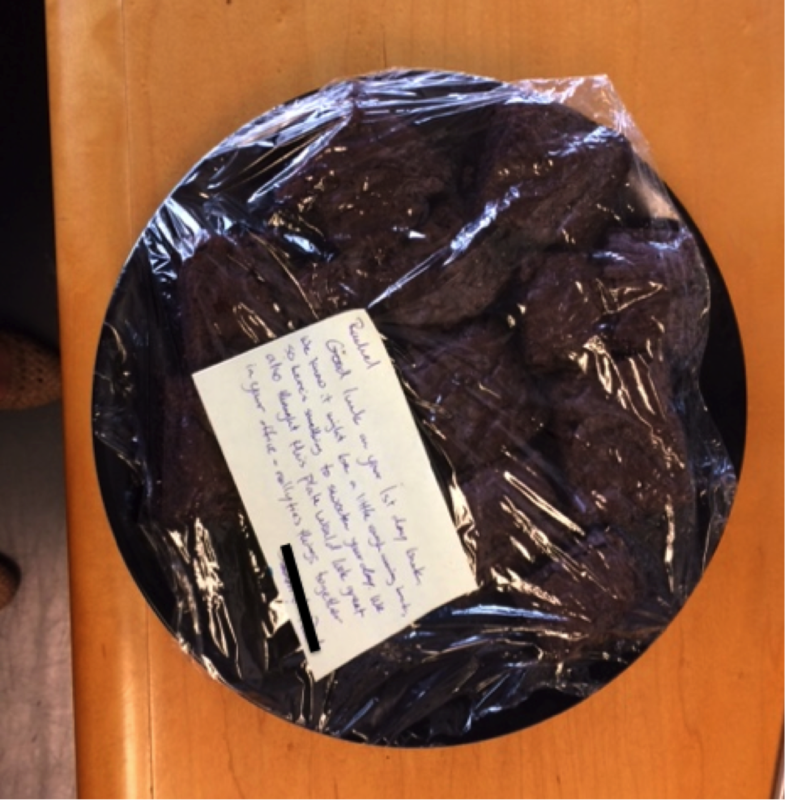 I was just about to read the note when I noticed the vessel that bore the brownies. A motherfucking black resin plate. The black plate. Sarah and Peter, those devils, had wrapped up a big middle finger in a pile of saran wrap and chocolate. You can imagine the poor receptionist's shock when my face went from curious smile to wide-eyed disbelief followed by a loud proclamation of, "Oh, goddamnit," followed by a partially stifled "motherfuckers." Clearly not the reaction she was expecting. I attempted to explain. It didn't go especially well. Maybe some day she'll stumble on this blog and understand. S&P, just remember that revenge is a (black) dish best served cold. And you know I like things done right.